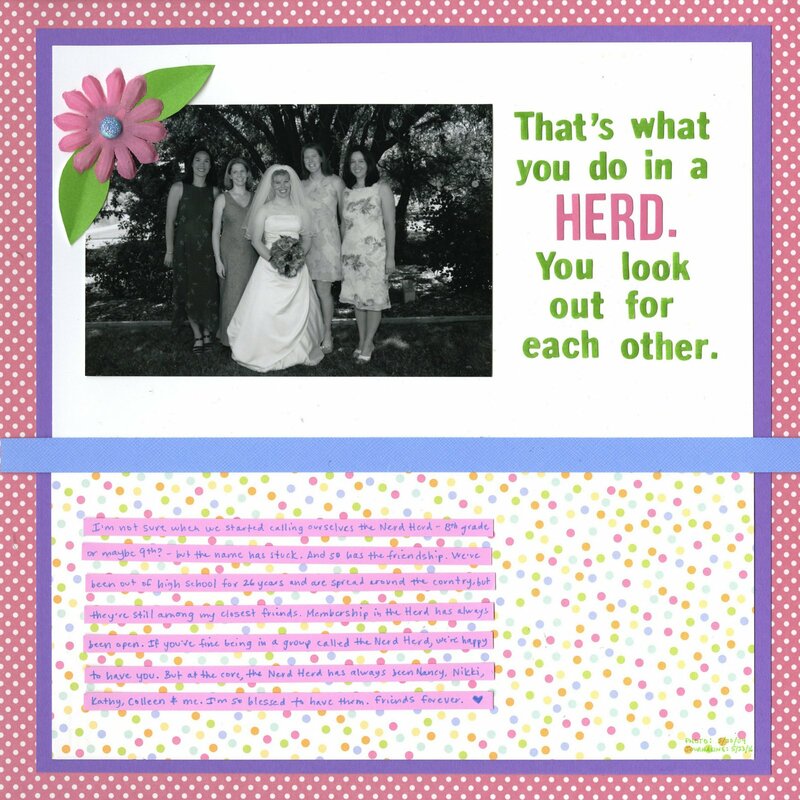 One of the hardest National Scrapbook Day challenges for me was the color challenge, partly because of the required color scheme and partly because the layouts had to honor the amazing women in your life. Don't get me wrong: I love purple, pink, blue and green together, and I'm blessed with many amazing women in my life. But I didn't have photos of female family members or friends on hand that would work with those colors AT ALL. In fact, nothing I had was going to work with those colors. Time to consider going black and white. I think this was the very first time I've scrapped a black and white photo. I'm not usually a fan of black and white, but it was the only way I could feature the required colors without it clashing horribly. Besides, I'm always glad to stretch myself creatively on NSD. Anyway, I'm the bride in the photo. The four women next to me are my lifelong friends Nancy, Nikki, Kathy and Colleen. Somewhere around 8th or 9th grade, we started calling ourselves the Nerd Herd. We've been out of high school for 26 years and we still call ourselves that. Over the years, there were (and are) many other members of the Herd, but the five of us are the core. I'm so glad I remembered the line from Ice Age where Manfred tells Diego, "That's what you do in a herd. You look out for each other." It makes the perfect title for my page and is exactly what our friendship is all about. I love love love this! LOVING the colors, the title and that you used the B&W photo to match your color scheme!!!!!!!!!!!! Beautiful! You did wonders with these colors. The B&W is perfect. Love the b&w and how the page turned out as a whole! I looked at that challenge and didn't even attempt it because I didn't have any products that I thought would work. You did a beautiful job on this page and I really love the story behind your title. So pretty! I see B&W photos on layouts too and I like it! I've done it a few (?) times but I need to remember to do it more often! Cute quote/title and I love the journaling on purple strips! The B&W fits perfectly. And the quote, too. I use b/w photos when my shots are blurry but I don't have any good ones in colour.